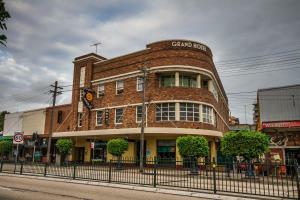 Situated opposite Rockdale Train Station, Grand Hotel Rockdale offers an onsite bar and a cafe restaurant, a lounge area and free parking. All private rooms are located above the pub. Grand Hotel Rockdale is 12 minutes' drive from Sydney Airport. It is 20 minutes' drive from La Perouse. Sydney Olympic Park is 35 minutes' drive away. All rooms have access to shared bathroom facilities and a communal kitchenette. Each room has bed linen and towels provided. Important Information: Please note that you cannot check in outside reception opening hours. Please note that there is a 1.5\% charge when you pay with a Visa or Mastercard credit card. Please note that Grand Hotel does not accept American Express credit cards. Please note Boshetto Cafe is open every day from 9:00 until 16:00. Guests are required to show a photo identification and credit card upon check-in. Please note that all Special Requests are subject to availability and additional charges may apply.